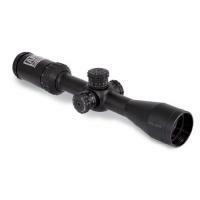 Bushnell AR93940 3-9x 40mm AR OPTICS Riflescope AR93940 FREE SHIPPING! Strike bullseyes and hit targets from further than you ever thought possible using the 3-9x 40mm AR Optics Riflescope from Bushnell. With its ruggedized construction and top-of-the-line optic lenses, the powerful scope is ideal for hunters, tactical operatives and marksmen from all walks of life. Multi-coated all glass lenses allow for maximum light transference, resulting in a greater image clarity and enhanced contrast between colors. This Bushnell's Drop Zone 223 BDC reticle to show up clear as day on any color background. Extended eye-relief and an adjustable zoom only add to the riflescope's tactical versatility, providing users with quicker target acquisitions from a range of distances. ©2002-2019 CopsPlus.com: Bushnell AR93940 3-9x 40mm AR OPTICS Riflescope AR93940 FREE SHIPPING!